Construction, 12% of the worldwide steel abrasives market. 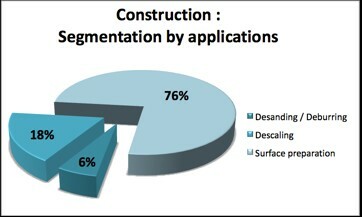 The construction market represents 12% of the worldwide abrasives market. Steel abrasives play a key role in its production processes. Importance of roughness level and surface appearance. Non-contamination of blasted surfaces and need for low-conductivity media. With the creation of dedicated products, equipment and services, W Abrasives offers solutions for each segment of the construction market. For example, Profilium is a high performance alternative to expendable or standard metallic abrasives used in the construction sector. Profilium increases productivity by 20% in comparison with traditional abrasives in optimum conditions of use. Its roughness profile and peak density ensure greater adherence.